Tim Olive moved recently to Kobe, Japan, driving deeper and deeper into the beastwind he roils up with various playing partners. The beastwind is, at times, grinding, plangent, massive. It is also – and in this regard he overlaps with folks like Kevin Drumm, or Will Gutrhie – shape-shifting, labile, windshear giving way to thin sheets of electricals, solar squalls subsiding to something like soothing particle rains. The spatial and dynamic scale of Olive’s sound-world is really impressive. I can be done with wind metaphors, but listen to Olive’s last two releases on his own 845 Audio label, you’ll hear how easy it is to slip into the nomenclature of thermals, gale-force, and the like. Olive produces this impressive scale of densities, timbres, even mimetic sounds of the natural and supra-natural world, with quite simple materials and means – pared to essentially one amplified string, some pick-ups, a mixer, and springs and stuff applied to the pick-ups. Played with great alacrity, endless ideas in fluid motion, and an unswerving patience and attunement to playing partners. Olive knows many things, and channels them through a reduced instrumentation – I love limits, he said in an interview last year. 33 Bays, Olive’s 2012 duo release with Alfredo Costa Monteiro, is stellar; the pair collaborated in Barcelona and Osaka five years ago, and happily have sustained their rattle and roil in occasional meetings like this one. Monteiro has not released a weak recording in the years I’ve followed him, whatever the variance in their grip on me. His two working groups with Ferran Fages, Atolón and Cremaster, are as good as it gets in electro-acoustic music that moves from high-wire tensions of silence to bruising fun. Monteiro’s solo organ release, Umbralia, is a work of amazing attention to the interstices and spaces between notes, Monteiro the colorist, and certain to baffle those who associate him only with the blistering Cremaster. 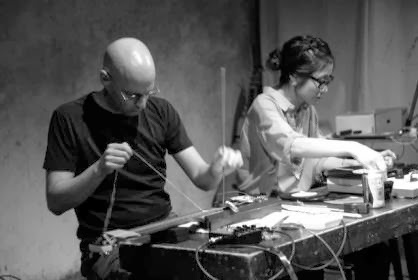 So 33 Bays, whose duration does not overstay its ideas nor malinger past necessity, enjoins and rips apart two simpatico improvisers who often sound as if they’re making music from inside a Richard Serra sculpture. The occasional dynamic drops in density and volume are hypostatic, you’ll literally reel and wobble from their effect. This is music that is at once driven (I’ll skirt the meterological here), and nuanced, and should be heard and huzzahed about alongside stuff like Drumm’s Humid Weather, or Daniel Menche’s Field of Skin. ...but the hedgehog knows one big thing. Olive joined forces with turntablist (and more) Katasura Mouri for Various Histories, another superbly paced release, five tracks of concise exploration of a mutual map – akin to 33 Bays, an impressive expanse of textures, fine details, and a vague sense of an unstable pulse threading through the whole affair. Katsura released at least eight CDs with the turntable group-turned-duo, Busratch, from 2000-2009; I haven’t heard that project, making my discovery of Katsura here especially a blast. As relatively low-tech as Olive, Katsura, like the fantastic Hong Chulki, coaxes, cajoles and throttles the table. This is another pairing that must have been, as Keith Rowe said about his first encounters with Toshimaru Nakamura, a relief for the players – how often do musicians share this level of confidence, guts and ideas, and manage the ground between them (I think of Scenic Railroads for one, the occasional duo of Mike Shiflet and Joe Panzner) so skillfully? I think Tim Olive knows one big thing that is multi-faceted and, to date, unexhausted – he knows how to dive deep with simple materials, and he knows how to combine with similarly gifted playing partners. I’m a hedgehog, Olive told an interviewer, I concentrate on my ground, I get down in there and root around and explore all the parameters and minute variations. Sure – but a fox as well, in terms of Berlin’s elegant, cartoonishly simple dichotomy. Olive brings to his deconstructed table, and his meetings with remarkable musicians like Monteiro and Mouri, an embarrassment of ideas and a barrage of effects. I am a hedgehog, says the fox. 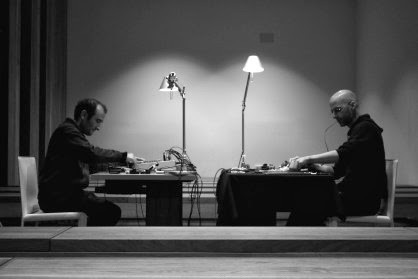 Title: I like the word beastwind – it is a track title from Olive and Monterio’s first duo release, a theory of possible utterance (zeromoon, 2011), and an apposite descriptor of their sound. This entry was posted in music writing on January 9, 2014 by jessewgoin.